Lorraine Hansberry, at twenty-nine, became the youngest American, the fifth woman, and the first black playwright to win the New York Drama Critics Circle Award for the Best Play of the Year. Her A Raisin in the Sun has since been published and produced in some 30 countries, while her film adaptation was nominated by the New York critics for the Best Screenplay and received a Cannes Film Festival Award. At thirty-four, during the run of her second play, The Sign in Sidney Brustein's Window, Lorraine Hansberry died of cancer. In the years since her death, her stature has continued to grow. To Be Young, Gifted and Black, a dramatic portrait of the playwright in her own words, was the longest-running Off-Broadway drama of 1969, and has been recorded, filmed, and published in expanded book form, and has toured an unprecedented forty states and two hundred colleges. In 1986, following the stage production of the 25th anniversary of A Raisin in the Sun by the Roundabout Theatre in New York City, the play was widely acclaimed as in the foremost ranks of American classics. In 1990, the PBS American Playhouse TV adaptation of the 25th-anniversary version had one of the highest viewing audiences in PBS history. 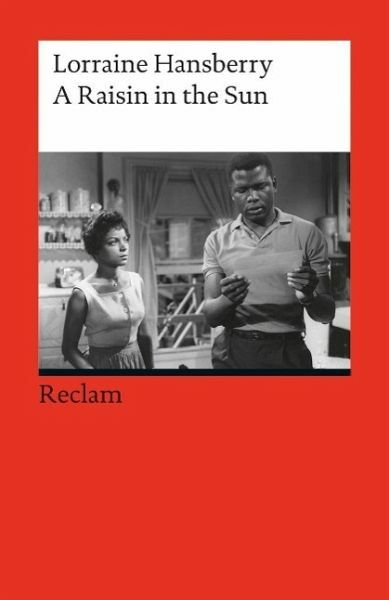 Les Blancs, her last play-posthumously performed on Broadway and recently in prominent regional theaters-has been hailed by a number of critics as her best. Robert Nemiroff (1929-1991) was a Broadway producer and the literary executor of Lorraine Hansberry's estate. bin wieder sehr zufrieden. bestelle jede schullektüre für meine tochter bei bücher.de. jedes buch verfügbar, sehr schnelle lieferung und portofrei !! !